Cordless Kettle Tipper Suits Most Cordless Kettles. An innovative item that will be of interest to those that have with a weak or painful grip - and have a keen eye for a bargain! 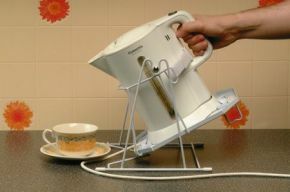 This cordless kettle tipper, as its name suggests, allows the user to pour their cuppa safely, and with minimal effort. A metal plate secures the base of the cordless kettle, and an elasticated strap makes sure the kettle stays where you want it to! You don't have to worry about potentially scalding spills, even in the event of the kettle accidentally being released during pouring - thanks to a back stop feature built into the frame.